Oh those unique plates, they get me every time. I discovered these dapper animal plates at West Elm. These design on these plates are based on paintings of real animals, which designer Rachel Kozlowski then dressed and accessorized with subtle metallic accents. There are a variety of the animals available, owl, ram, penguin and snow leopard. I didn’t want to mix it up that much and just bought myself the owls. I loved that they were in their top hats. I thought they looked like they are all dressed up for a formal even, such as New Year’s Eve. Gold chargers were an easy choice for this table, but I didn’t know what I would do for dinner plates. A trip to Home Goods found these lovely dinner plates with black stripes and gold trim and I knew exactly which salad plates I would use! 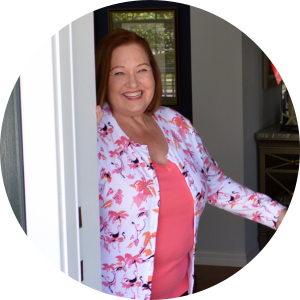 These were one of those Home Good’s finds that I knew were just meant to be! The flatware is Towle Living Vienna pattern which is a bargain at $61.88 for service for eight at Amazon. I found these cute little white owls at Pottery Barn. They are actually designed as Christmas Ornaments, but I cut off the rope hanger from the top, gave each owl a little black top hat and a pair of glasses which came from the scrapbooking aisle. Gold and white napkins tucked into simple gold napkin rings were tucked rather formally at the edge of the dinner plate. 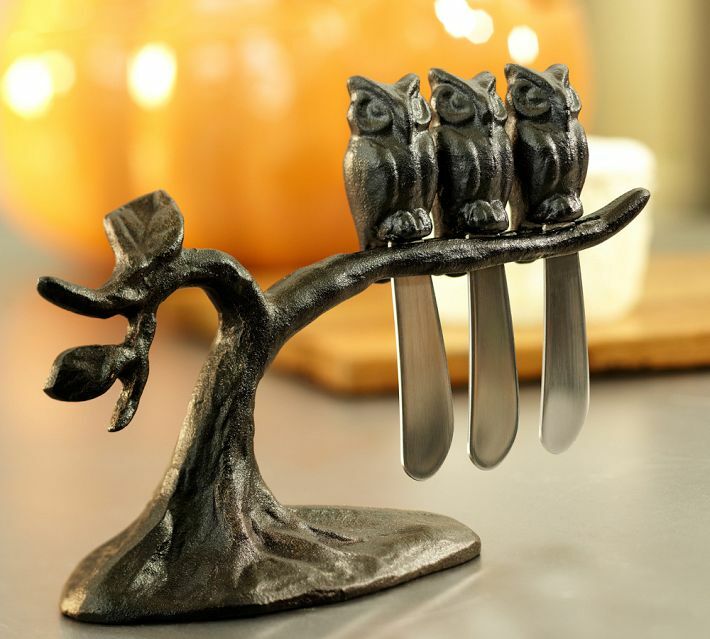 How adorable were these little owl salt and pepper shakers? When I saw these at Target, I knew they had to grace the table with my dapper owl plates. They look so wise, don’t they? I haven’t seen them for sale there again but I found these cute little owl salt and pepper shakers that would coordinate well with my dishes. Have you seen these candlesticks before? 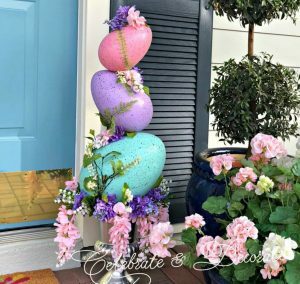 I have used these for Halloween painted black here and at my Alice in Wonderland Baby Shower to display the Mad Hatter’s hat collection here. Those wooden candleholders have see a lot of parties in a lot of colors. 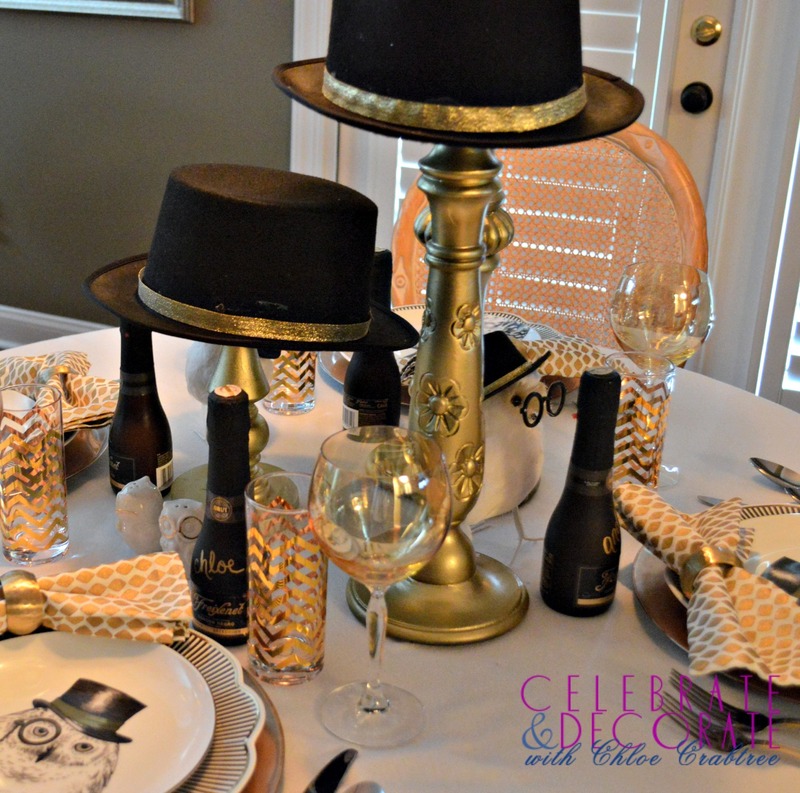 For this table they were once again used to display hats, but in keeping with our plates, each candleholder sported a black top hat with gold trim. 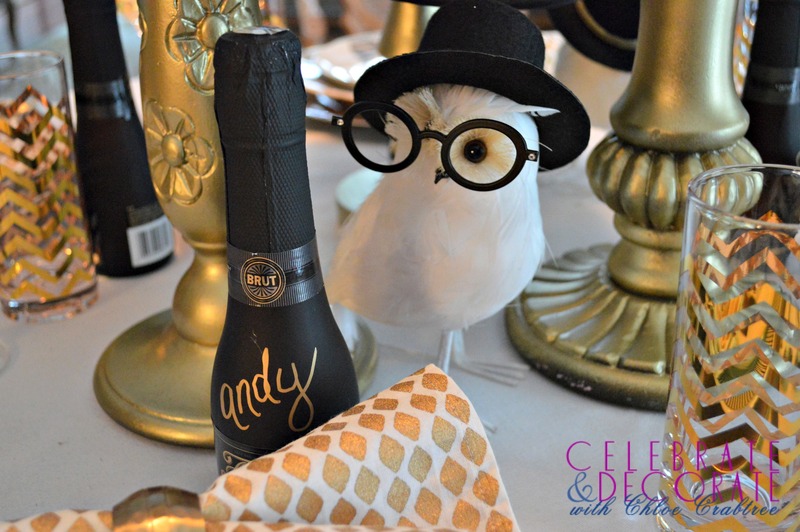 Since I am planning this table for New Year’s Eve, the little bottles of Freixenet bubbly made great place cards. I simply took a gold Sharpie and wrote each guest’s name on their bottle. It was a place card and a favor all in one! This black and gold and white table would be a wonderful way to welcome guests for any occasion, but I think it will be perfect for New Year’s Eve, don’t you? 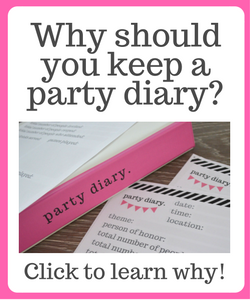 How do you come up with ideas for a blog post, a craft or a party? I LOVE, LOVE, LOVE this table. Perfect for New Year’s Eve. 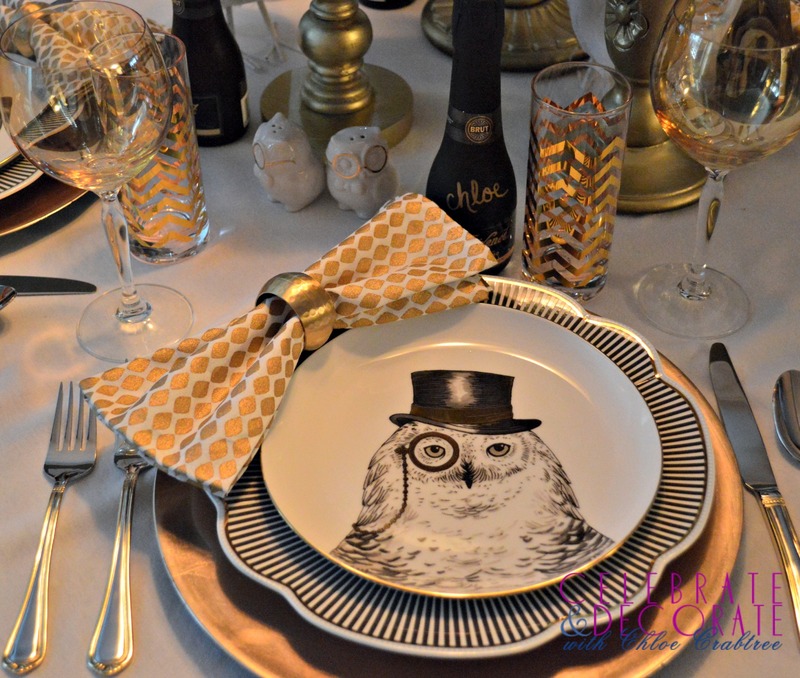 I collect owls and as you know I love those plates and I’m really into black and gold right now. I will be sharing this on Facebook soon! Thank you Dawn! You know I couldn’t resist those plates, either! Thank you for sharing! Merry Christmas! This is super fabulous Chloe! 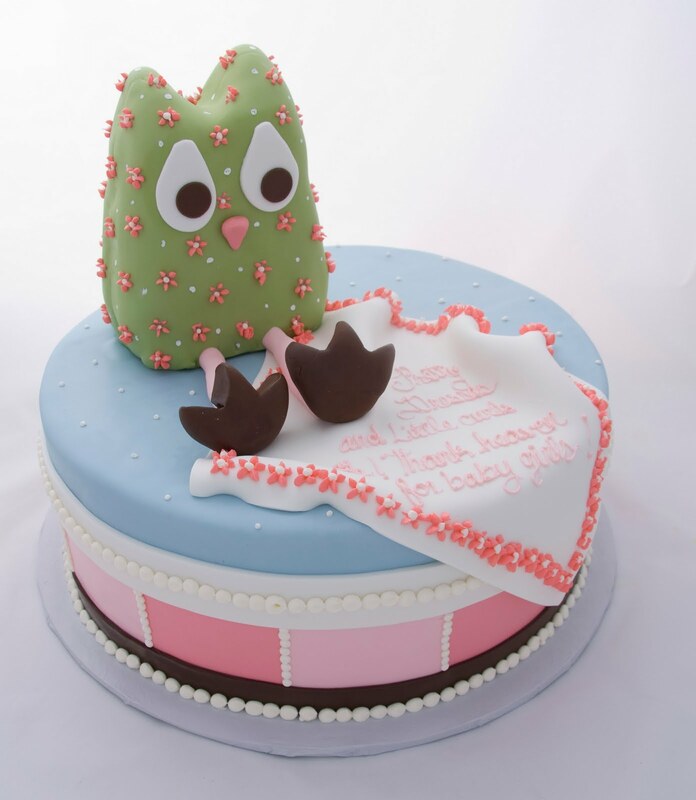 The owl plates are too cute! Love the gold pen names on the black bottles for place cards and the mix of gold geometrics with all the black and white!! Wonderful, wonderful job, Chloe! I must admit those unusual dishes pull me in every time, too. It’s as if they know how to get to your very core! 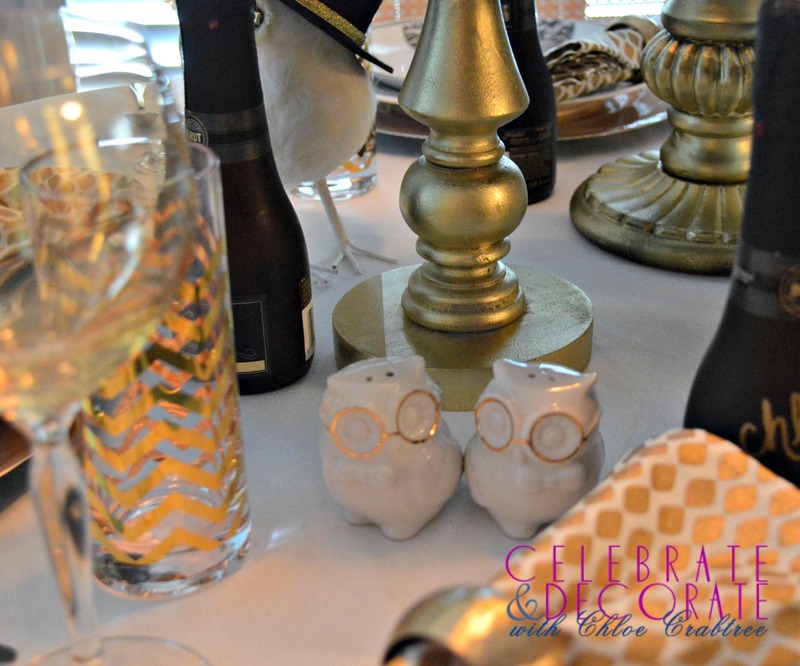 I love the owls, and they will be a wonderful choice for many holiday tablescapes to come, I’m sure! They do look mighty dapper in their top hats and monocles! And you found the S&P shakers at Target?!??!??! Wow…great! 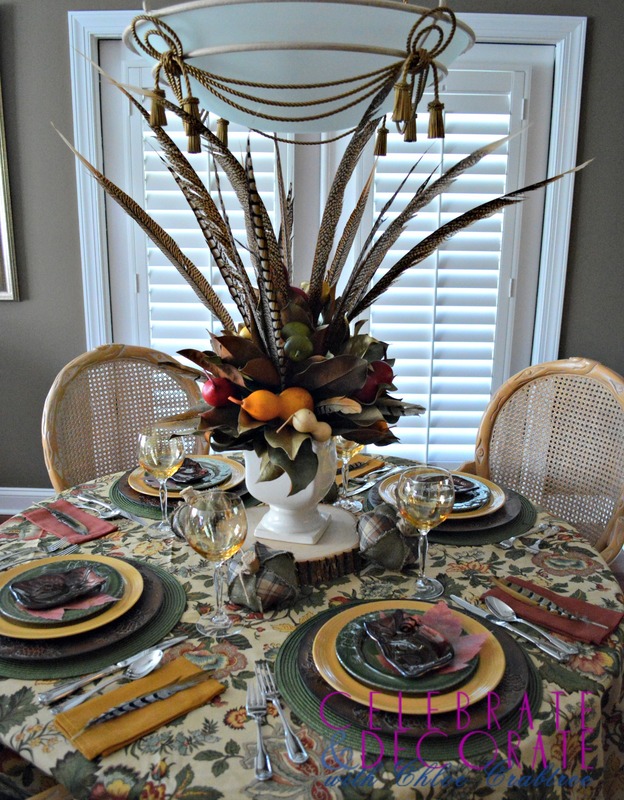 You created a really terrific table for New Year’s Eve or any day in this season. Enjoy, and Merry Christmas to you and yours! 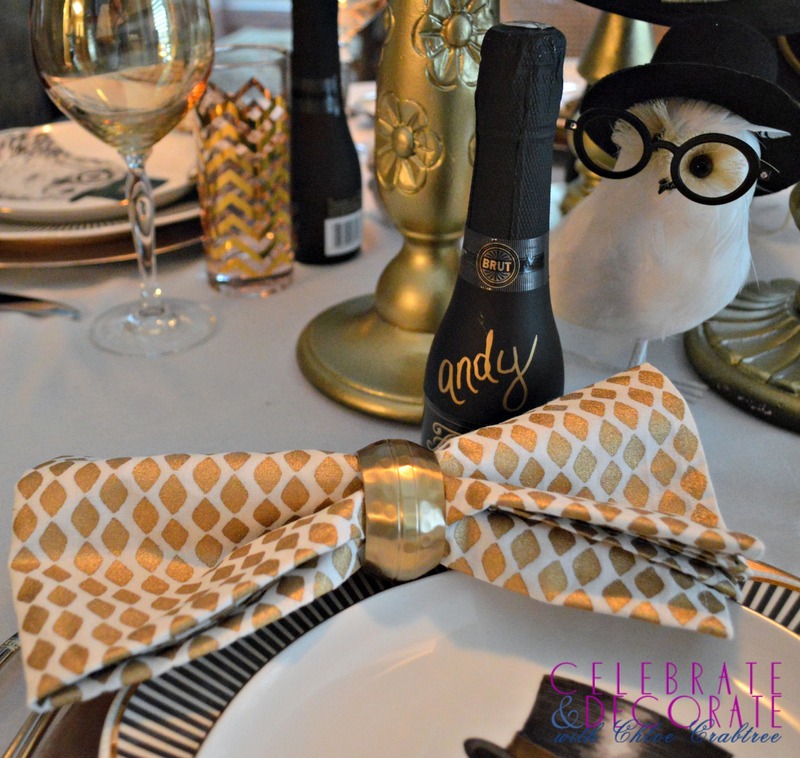 Oh my gosh, this tablescape is absolutely adorable. Magnificent! 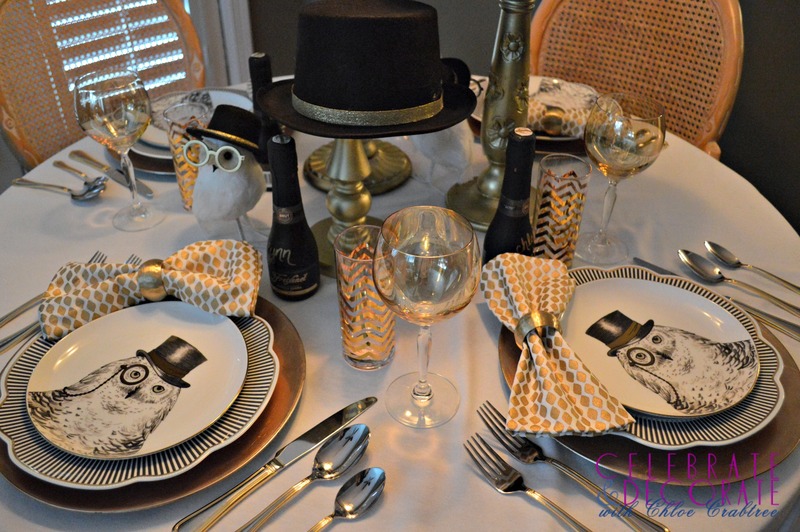 Thank you Valerie, I fell in love with these owl plates and just had to design a table around them! Thank you so much for sending me this link! I got 6 of these owls when they went on sale but didn’t get to use them for New Year’s as I intended. You are right. Those striped plates are PERFECT with them. I may never be able to use them now because all I will be thinking of will be this version by you. 🙂 I love every detail of this table but decorating the owl ornament like that just makes me smile and smile. 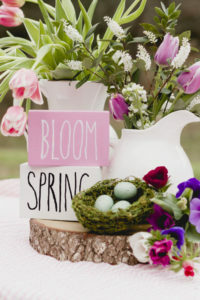 A whimsical and yet still very elegant table, just perfect for a real celebration! Oh, Barbara, I am sure you will find your own way to put your own spin on a table with the owls! Make sure when you do, you share it with me! I won’t want to miss it!